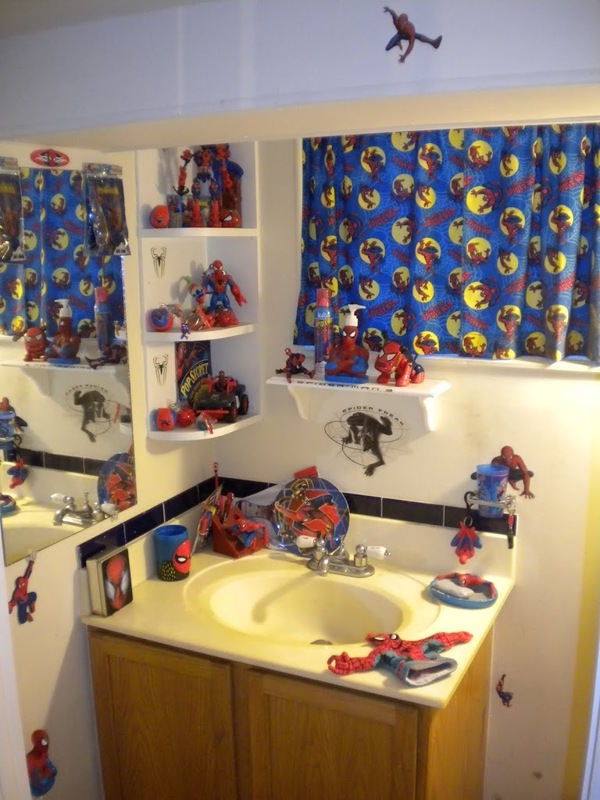 Thank you all for coming today to celebrate the life of one of the finest rooms I’ve ever had the pleasure of knowing, the Spider-Man Bathroom. It had a good, albeit short life, and I hope we can all remember the good times we had there. You might call it the conversation piece of the house, you might call it nerdy and weird, or you might call it awesome and hilarious. However you felt about it, you can’t deny, it was unique. I remember when we first bought this house. It was April 2006. Everyone was buying houses, and mortgages were given to poor people, homeless people, and stray cats. The value of your home is only going to up up up, they told us. Better buy now before no one will be able to afford a house! So I quit my job, enrolled in grad school, Simone got pregnant and we bought a house. A house with TWO bathrooms! It started out fairly small. A Spider-Man soap dish, some Spider-Man towels, that sort of thing. 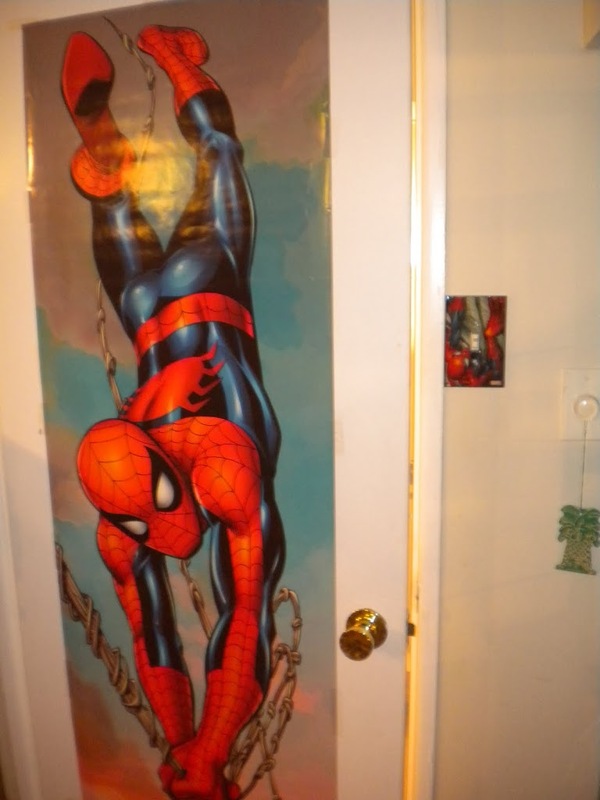 Then my mother made Spider-Man curtains, and it started to take on a life of its own. I got a Spider-Man toilet seat. I put up Spider-Man shelves. 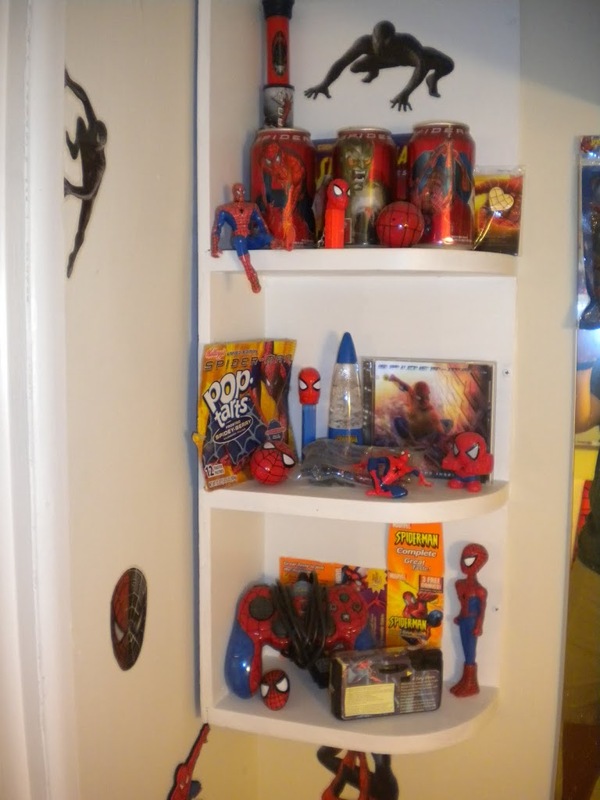 I filled those shelves with every Spider-Item I could find. By the time I was finished (can one ever truly be “finished” with something of this nature) it was a wonder to behold. Today Ruby and I spent the morning packing up my comic books. Edward spent the morning pooping repeatedly, but that’s another story. As we filled my long boxes with a collection I started over twenty years ago, I thought about the bathroom again. You see, packing up my comics has been something I’ve been doing for years. I moved practically every year growing up, and then college, and a string of apartments, and then even into this house. Packing comics feels good, like we’re starting something new. 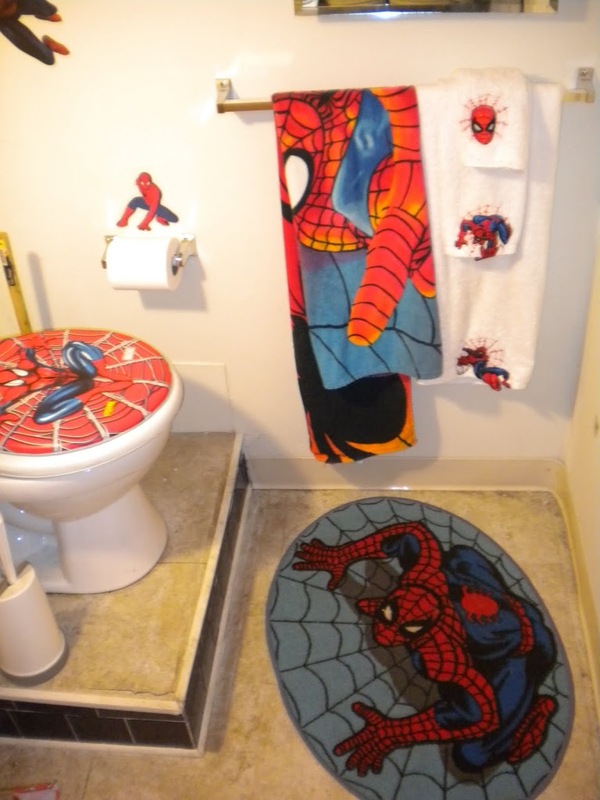 But packing up the Spider-Man Bathroom, that was different. I don’t know where we’re going next, but there’s no guarantee it will provide me with an extra bathroom to deface as I please. 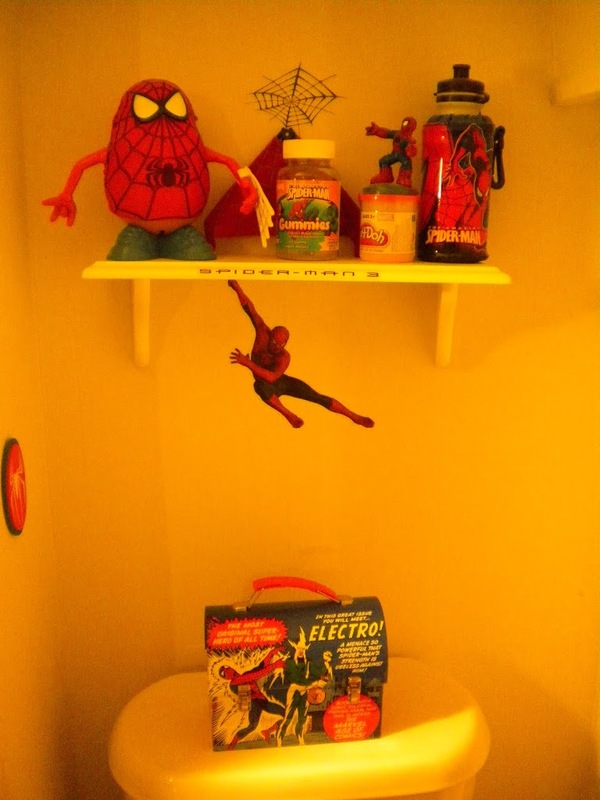 The Spider-Man bathroom may be in a box for a long time. 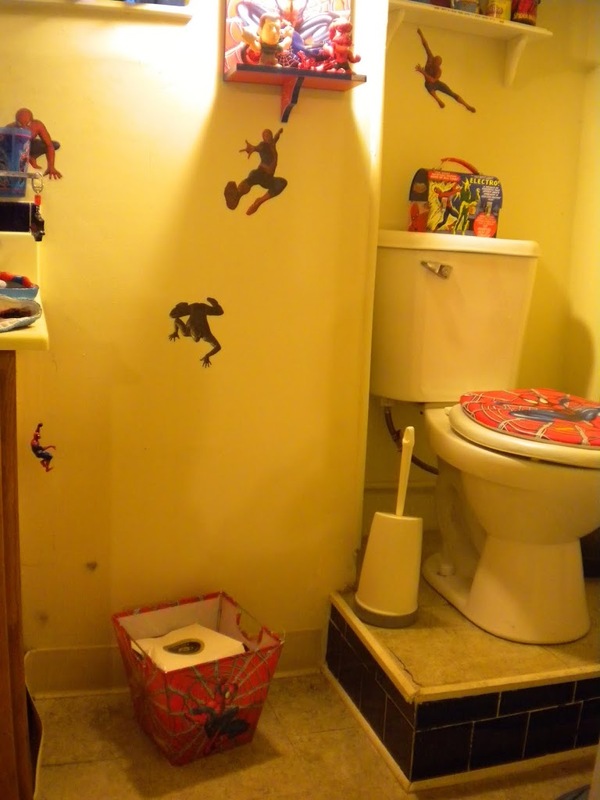 And not only that, the Spider-Man Bathroom has never been anywhere else. It is exclusive to this house, to this home. More than what was on the walls, it WAS the walls. Now that the room is empty, except for Ruby’s underwear (and honestly, there is not a room in this house that does not have Ruby’s underwear hiding on the floor somewhere), it stands as reminder that in a few weeks I will be leaving this house, and I won’t be coming back. I don’t think the fact that we are moving was really real to me until the Spider-Man Bathroom came down. So let’s raise a glass to the coolest, nerdiest, lamest, most awesome room in my house. You will be missed, Spider-Man Bathroom, and you will never be forgotten. Posted in Bathroom, Moving, Photo, Spider-Man. I loved that bathroom. Sigh. Glad you took some final photos of it to commemorate. This is going to sound weird but I definitely used it every time I was at your house, even though my head would hit the ceiling when I stood on the toilet platform.